Saudi Arabia’s spymaster Prince Bandar bin Sultan arrived in Moscow today for his second round of talks in four months with Russian President Vladimir Putin. News of his arrival in the Russian capital was broken this afternoon by Khaled al-Matrafi, regional director of Saudi-owned TV news channel Alarabiya. Prince Bandar’s visit to the Kremlin comes less than a month since Putin, a strong backer of Syrian President Bashar al-Assad, called Saudi King Abdullah to discuss international efforts to end the Syria crisis. Russia last month sharply criticized Saudi Arabia's decision to reject membership of the UN Security Council over the body's failure to resolve the Syria war, which has been fought for over two-and-a-half years. The most significant recent contact between Moscow and Riyadh was a meeting between Putin and Prince Bandar last July 31. 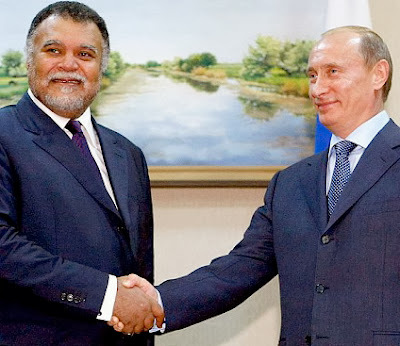 I assume the new round of Putin-Bandar talks opens the bazaar between the pair over the upcoming Geneva-2 peace conference slated for January 22.